An interesting gun, signed T Perrins on the locks, and faintly but clearly T Perrins Worcester on the barrel rib, it has 27 1/4 inch plain twist barrels with London proof marks and stamped LG (?) underneath. The engraving is fairly simple and a little unusual in that it has matching scrolls on all the furniture. It has a 13 1/2 inch pull, and is clearly intended as a ladies or youth’s gun. I would rate this as a fairly basic, but sound class of gun, I’m not sure where it was made, the proof marks suggest it was not Birmingham made, but I haven’t any lead on the barrel maker. As is known to Perrins followers, T.Perrins is normally associated with Windsor, Thomas was not previously known to have traded in Worcester as far as I know. This was my first restoration project, and it turned out to be quite a major undertaking for a first timer because the rib had sprung badly and the barrels had to be taken apart and re-soldered. 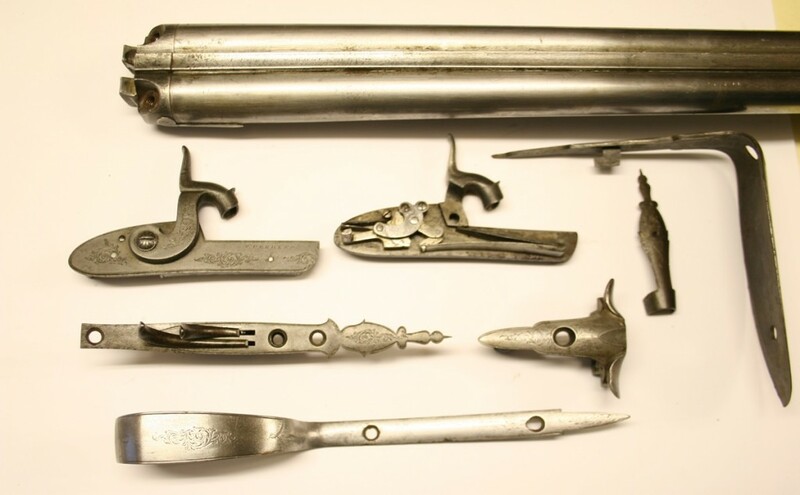 It was basically in fair condition, except that it had been either in a box or on a wall so that the left side of the gun had a number of rust patches on the barrel and at the front of the left hand lock, as well as some iron staining around the lock where the rust patch was. Unusual to see the same motif on the false breech and trigger guard finial as on the rest of the furniture I think I have seen similar engraving once or twice before on fairly basic guns, I think by Hollis – I would guess it probably wasn’t done locally but was a bought in set of parts – it would be good if I had a better understanding of how the gun trade worked ! I have something very similar but it’s engraved with Williams & Powell on the locks and Williams & Powell Liverpool on the barrel rib. I think this Perrins is a generic, low to medium quality gun made up from Birmingham produced parts, quite possibly also assembled in Birmingham, although possibly stocked in Liverpool, so I think there were hundreds, possibly thousands of very similar guns in circulation, probably only differing in the names engraved on them. Williams and Powell are listed at 10 Pool Lane, Liverpool in 1833, then various addresses in South Castle Street 1834 – 1870. I am not sure of the date of the Perrins, any time between about 1835 and 1855? Thanks for your interest – its good to hear from site visitors.